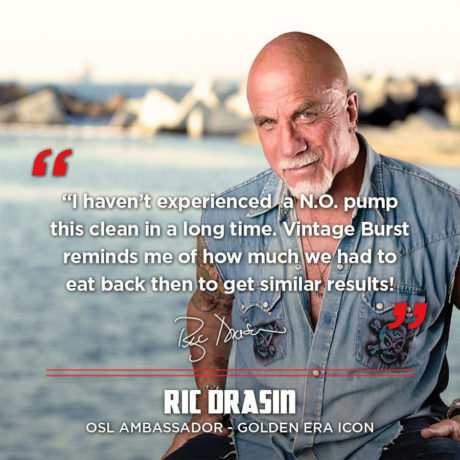 Vintage Burst™ is an all-natural supplement that is specially formulated to keep nitric oxide levels elevated for hours – enabling bigger and better pumps and higher-intensity workouts. Or better yet! Save 10% and never run out. You can cancel at any time. 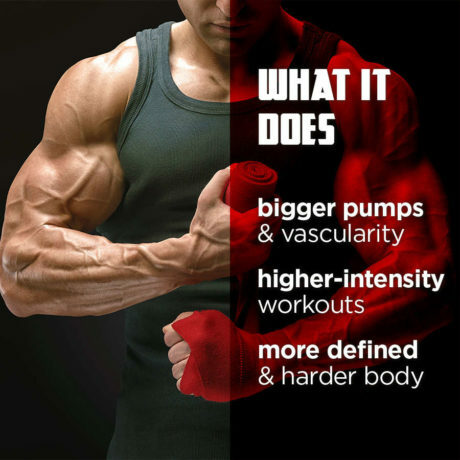 The enhanced blood flow generated by elevated levels of NO helps build fuller muscles and makes it easier to achieve massive pumps and awesome vascularity. Your entire body will feel harder and look more defined as a result. 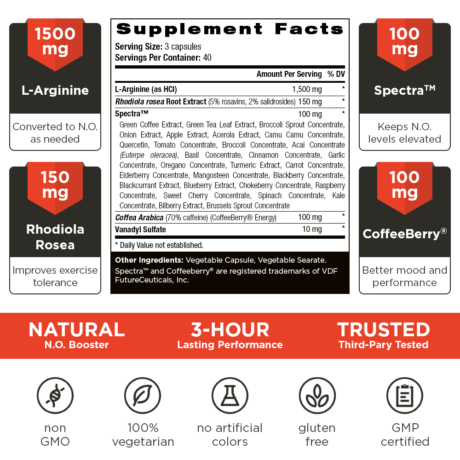 Vintage Burst™ contains the right amount of Spectra™, a blend of 70 key nutrients, as well as the amino acid arginine, which your body can convert to NO as needed. Together, these two powerful ingredients fight against fatigue, allowing you to train at higher intensities for longer. Unlike other NO supplements you may have tried, Vintage Burst™ will not make you feel like your head is ringing. It also stimulates antioxidant activity, helps remove ammonia from your body, and can improve your mood and metabolism. 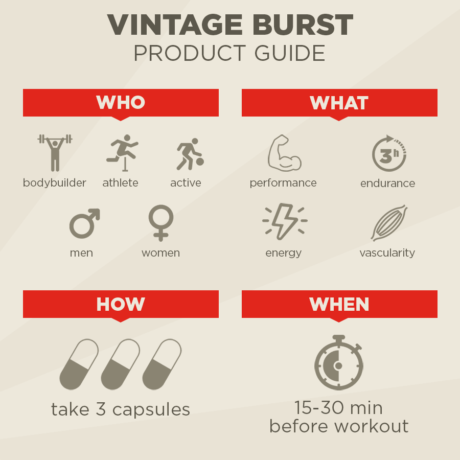 Vintage Burst is part of our Energy & Recovery supplements range. We created it because achieving a balanced, head-turning musculature should never come at the expense of your health. Nitric oxide (NO) is best known for regulating blood flow, including to your muscles. The greater the flow of blood to your muscles, the more oxygen and nutrients they receive. This leads to better performance and bigger pumps. However, NO doesn’t last long. Once it appears in your bloodstream, it can vanish within seconds or even milliseconds. Normal NO supplements may boost the level of nitric oxide in your body, but the effect is very short-lived. For us at Old School Labs™, that just doesn’t make sense! Unlike other nitric oxide boosters, Vintage Burst contains a proven ingredient that keeps blood NO levels elevated for 3 hours, naturally. Used twice daily, Vintage Burst™ can provide up to 6 hours of NO support. Vintage Burst also includes nutraceuticals that enhance your exercise tolerance, so that training at higher intensities becomes less difficult. Even better, Vintage Burst™ makes you feel good and is good for you. Not all supplement ingredients that go by the same name are created to be equally as effective. Just as there are different qualities of the same cut of meat, there are different qualities for the same supplement ingredients. Few companies can say that they hand-pick each of their ingredients, carefully and patiently waiting for that ingredient’s prime season of maximum potency; harvesting and processing each ingredient carefully to ensure that only the most premium and bio-available ingredients make the cut into their products. At Old School Labs™, we set out from the start to be a premium and uncompromising brand, delivering exclusively premium products. We sell our products directly to you and are therefore able to afford including only the best quality ingredients in all our products. 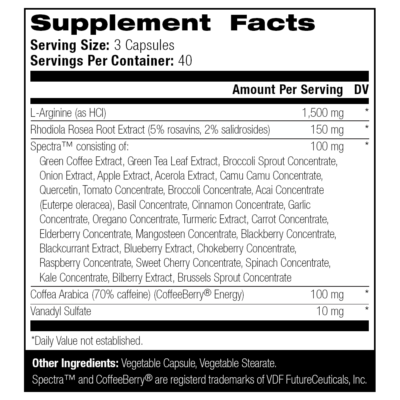 Press More to read about the ingredients you will find in Vintage Burst™ in descending order of weight. Arginine is a naturally occurring amino acid that plays an important role in cell division, immune system response, healing wounds, removing ammonia from the body, and releasing hormones. The body can convert arginine into NO as needed. Rhodiola rosea is an “adaptogen,” which enhances your ability to cope with exercise and other forms of stress. Rhodiola improves exercise tolerance, which makes it easier to train at higher intensity levels. The rhodiola in Vintage Burst™ is checked through DNA analysis to ensure that it’s 100% genuine. Spectra™ is made from fruit, vegetable, and herb extracts and concentrates. In a clinical study involving healthy men and women, Spectra™ was found to elevate nitric oxide (NO) levels by 64%, with the effects lasting up to 3 hours. It also increased mitochondrial oxygen consumption by 146%, and reduced reactive oxygen species (ROS) levels by 42%. Spectra™ also displays antioxidant properties against 5 free radicals believed to pose a threat to human health and performance. The coffee cherry is the fruit of the coffee plant. In addition to caffeine, coffee cherry contains numerous beneficial compounds in levels higher than occur in regular brewed coffee or even the coffee bean (seed) itself. Caffeine is well known for its effects on energy, mood, metabolism, and performance. Vanadyl sulfate is an “insulin mimicker” that works to increase the amount of glucose and amino acids driven into muscle. It is also used to enhance pumps and muscle fullness, as well as vascularity. The other ingredients section on supplement labels has unfortunately become a convenient place for some companies to hide their sub-par ingredients, fillers and additives in plain sight. This is where you will commonly find the usual cost-cutting and unnatural ingredients that do nothing to help your health - ingredients such as sucralose, aspartame, gelatin, artificial flavors and colors, and a plethora of cryptic chemical substances that really don't have their place in your body if you want what is best for it. Our rapid-release vegetable capsules are completely see-through and made only from plant cellulose. No gelatin is ever used. The highest quality vegetable-based stearate is used to ensure that each and every capsule contains the same amount of active ingredients. For use as a dietary supplement for men and women. Take 1 serving (3 capsules) of Vintage Burst™ 15-30 minutes before your workout (tip: for incredible workouts, stack with Vintage Blast™ pre-workout). For a prolonged NO energy boost, take 1 serving before your morning or midday meal. Do not take more than 1 serving within 3 hours. This product was produced in a cGMP facility that also processes ingredients containing milk, egg, soybeans, shellfish, fish, tree nuts, and peanuts. Consult your physician prior to using this product if you are pregnant, nursing, taking medication, or have a medical condition. Do not use if seal is broken. Contains caffeine: too much caffeine may cause nervousness, irritability, sleeplessness, and, occasionally, rapid heartbeat. KEEP THIS PRODUCT AND ALL SUPPLEMENTS OUT OF REACH OF CHILDREN. Can I take this with creatine? Yes. Anecdotally, some bodybuilders say they get even better, longer-lasting pumps and muscle fullness when stacking Vanadyl Sulfate (a key ingredient in Vintage Burst™) with creatine. Vintage Build™ is a great source of high-quality creatine and stacks very well with Vintage Burst™. 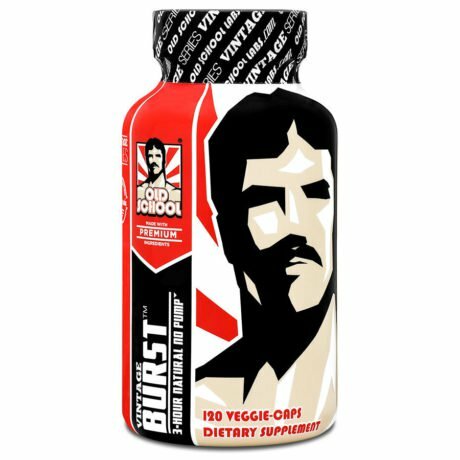 Can I use Vintage Burst™ on a fat-loss or fat-cutting diet? Yes. Fat-loss or fat-cutting diets typically require eating less food (i.e., cutting down on your calories). This may cause your energy level to fall and your metabolism to slow, making it harder to lose fat. When you’re on a calorie-reduced diet, you may also be eating fewer antioxidant-rich foods. Besides boosting your energy and metabolism, Vintage Burst™ supports healthy antioxidant levels with Spectra™. Is there a type of workout that works best when taking Vintage Burst™? Vintage Burst™ can be taken before any type of exercise. For the best pumps, we recommend keeping your rest between sets between 30 and 60 seconds. Can I use Vintage Burst™ as a pre-workout? Vintage Burst™ can be used as a light pre-workout. For more energy and pumps, try our two-stage pre-workout, Vintage Blast™, which is designed to help you take full advantage of your workouts. Can I take Vintage Burst™ on the same days I take other Old School Labs™ products? Yes. Just make sure the total amount of caffeine you are taking from all sources doesn’t exceed your tolerance. For example, if you tolerate 400 mg (about 3 cups of coffee) or less of caffeine daily, make sure that you don’t exceed this amount. If you have any questions about this product please feel free to get in touch. At Old School Labs™, we pride ourselves in the quality of our products and our customer service.